*Please note: The bag and box order form below is for Maple Ridge residents only. If you live in Pitt Meadows, you can order recycling supplies through the City of Pitt Meadows. If you want a set of all boxes & bags, choose “Complete Set (one of each).” You do not need to click on each one. There is no charge for Maple Ridge residents – the cost of replacement boxes & bags is included in your property taxes. We deliver recycling boxes & bags every week on Saturday or Sunday (depending on staff availability – if we can’t do it over the weekend, we will deliver as soon after that as possible!). Note: If you are not home, we will leave them by your front door. 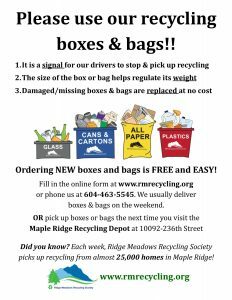 You can also order new ones by phoning us at 604-463-5545 or pick them up at the Maple Ridge Recycling Depot, just off River Road in the Albion Industrial Park. 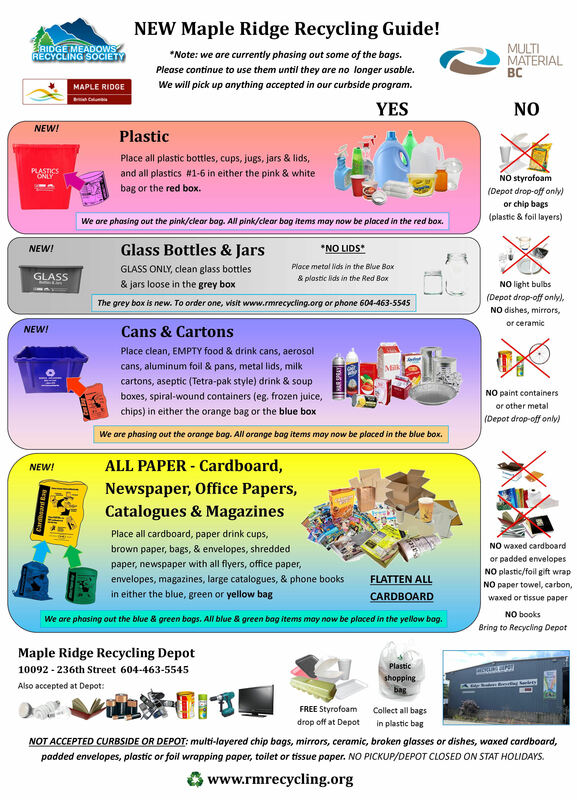 Download your pdf copy of the 2018 Curbside Recycling Sort Flyer. Please check off which boxes and/or bags you would like to order below. 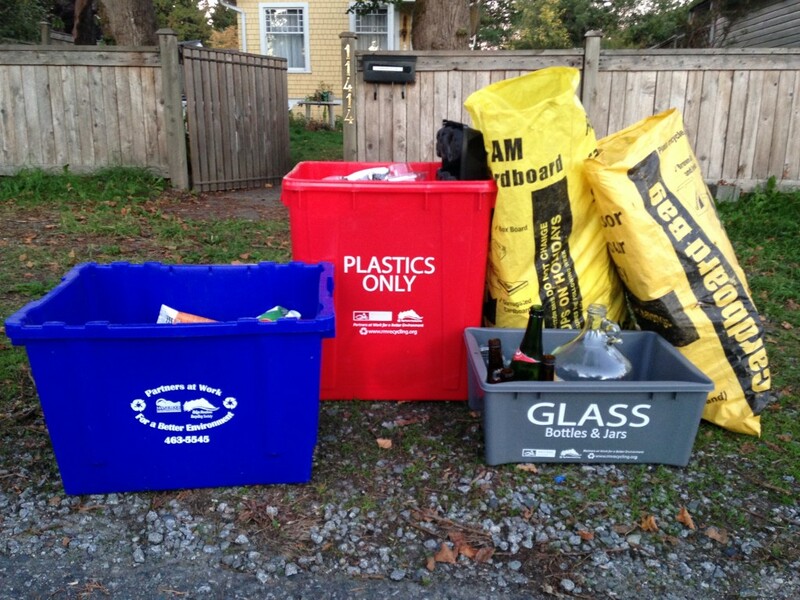 If you choose "Complete Set," you will be sent a full set of recycling boxes & bags. 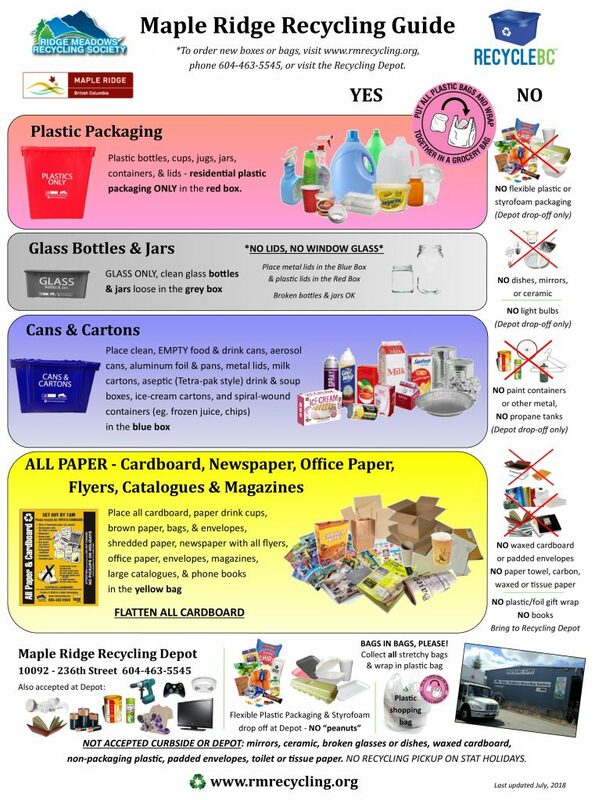 We only deliver recycling boxes and bags to residents of Maple Ridge. Please provide your address so we can drop off your new bags / boxes. We only deliver boxes and bags to residents of Maple Ridge. We need your email so we can send you a copy of your order. Your email address is not shared and you can opt out at any time.